New analysis using simple and transparent assumptions shows clearly the importance of early reductions in CO2 emissions. Many studies have looked at the rates of emissions reduction necessary to meet certain targets, most commonly looking at limiting temperature rise to 2°C. Some recently published analysis takes a complementary perspective. It looks at the implications for expected temperature rise of delaying the date at which CO2 emissions peak, assuming that the rate of decline from peak is limited by technical and economic constraints. The current level of emissions. This is around 10.5GtCp.a. (which is about 39Gt CO2 p.a. – the model works in tonnes of carbon so there is a conversion factor of 3.7 to put the data in the more familiar tonnes CO2). The rate of growth of emissions before the peak is reached. This is set at 1.8% p.a., based on the growth rate over the last two decades or so. The date at which emissions peak. Examining the effect of changing this variable is the main objective of the analysis. The rate of decline in emissions achievable after the peak. Rates from 0.7%p.a. to 2.4%p.a. are considered, assumed to continue indefinitely. The model assumes an instantaneous switch from growth to decline of emissions at the specified rates. A smoother peak appears more likely, but the precise shape of the peak makes little difference to the results. A more material assumption is that emissions growth before the peak continues at the historic rate of 1.8% p.a., which determines the level of peak emissions at any given date. This rate is based on an extrapolation that includes rapid growth in the 2000s, much of which has been due to growing coal use in China. Global CO2 emissions growth may well not continue at the same rate in future. The IEA’s Current Policies case shows CO2 emissions growth from energy use of 1.4% p.a. over the period 2011-2030. The New Policies Case shows growth of only 0.8% p.a.. BP forecasts a 1.2% p.a. growth over the same period, again with some policy action. However the lowest of these growth rates does include substantial policy efforts to reduce emissions, and by using historic rates of emissions growth the model appears intended to capture the consequences of continuing low levels of action. The final variable in the model is the amount that temperature rises in response to cumulative emissions, as measured by the transient climate response to cumulative emissions (TCRE). Climate models indicate that this response is approximately linear over the relevant range. Values of 1.5°C per trillion tonnes of carbon (TtC) and 2.0°C per trillion tonnes of carbon are examined, both well within current estimates of the expected range. The output from the model is peak temperature rise expected as a result of the chosen inputs, although it is recognised that no single parameter can completely capture changes to the climate. The results for different parameter values are shown in the charts below. The diamonds show historic emissions, which are extrapolated to a peak year. The area under the curve is cumulative emissions. The coloured regions indicate the warming that can be expected for each date at which emissions peak, with the transient climate response (TCRE) and rate of decline in emissions after peak as labelled on each chart. The implications of the modelling are striking. First, as many studies have found, it appears that the internationally agreed target of limiting warming to 2°C is very challenging. It only appears possible either if global CO2 emissions peak this decade, which seems unlikely, or climate sensitivity turns out to be at the lower of the two values examined and emissions can be reduced at 2.4% p.a. This is an ambitious rate of decline to sustain globally over decades. It requires (broadly speaking) new and replacement infrastructure to be almost entirely with low carbon and a rapid reduction in emissions intensity of energy, when there has been almost no reduction globally since 1990. Second, with 1.8% emissions growth rates before the peak, warming a 4°C or more looks likely if emissions can only be reduced by 0.7% p.a. after the peak, even with climate response of 1.5°C. Third with emissions rising at their historic rate each decade of delay in peaking emissions increases eventual warming by around 0.4°C. These last two results make it clear that suggestions that reducing CO2 emissions being less urgent than previously thought are unfounded. A corollary of the analysis is that action on short-lived climate pollutants doesn’t take the pressure off the need to limit CO2 emissions, although it does produce benefits over the next few decades. The implications of this analysis are too far reaching to describe and justify fully here, but a few stand out. They are mainly familiar, but take on renewed force in the light of this analysis. First, the scale and required rate of change in emissions appears unlikely to be driven by a single policy instrument such as a carbon price, valuable though that may be as part of a package of measures. A carbon price, however desirable, looks unlikely to be enough to drive the sort of systemic changes, including, for example, in grid operation, that will be necessary. And even if carbon prices could in principle achieve much of the necessary change they look unlikely to be widespread enough and high enough in practice over the next 10 or 20 years, even though the implementation of carbon pricing continues to progress. Other policy interventions will be needed. Second, a large proportion of the decarbonisation will need to be accomplished with the technologies we now have either already at scale, or with the potential to grow to very large scale within (at most) a few decades. Third, no one body or level of institution is likely to be able to drive the necessary change alone. Action is now taking place at a range of scales – individual, local, province, national and multi-national – and this looks likely to continue to be needed. Many are already aware of the needs for these sorts of actions. And much is being achieved. But much more remains to be done. It is to be hoped that this new analysis gives renewed impetus to action. 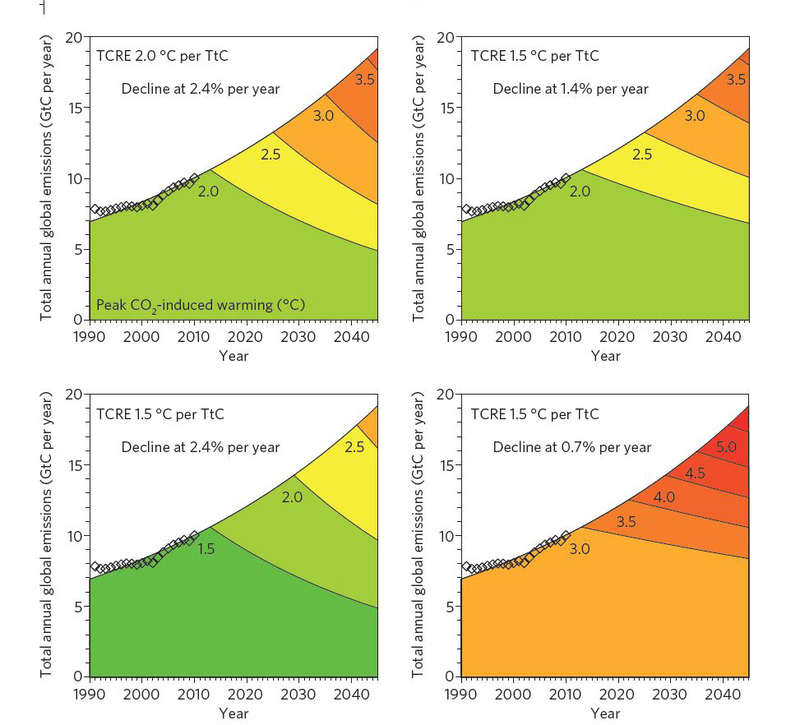 The modelling described here is reported in: Impact of delay in reducing carbon dioxide emissions, Myles R. Allen and Thomas F. Stocker Nature Climate Change (2013) http://www.nature.com/nclimate/journal/vaop/ncurrent/nclimate2077/metrics/news Stocker co-chaired IPCC Working Group 1 and is based in Bern. Allen is based at Oxford University. The model assumes a sharp peak in emissions. Instead a smoother transition can be modelled by replacing an immediate change from current growth rates to the long term rate of decline with a gradual change in the rate of growth. Illustratively, a case is examined in which the growth rate changes linearly from initial growth rate to the long term rate of decline over a 20 year period, assuming emissions tracks are the same before and after this period. This shows that total emissions are reduced by less than 10GtC compared with a sharp peak, thus reducing cumulative emissions by less than 1% of the total. The effect on results is thus small. Using lower values for the rate of growth to peak has a larger effect on the results than assumptions about the shape of the peak. The alternative emissions growth rates quoted in the text of 0.8-1.4%p.a. are from the IEA 2013 World Energy Outlook and the BP 2030 Outlook. If the peak is in 2040 cumulative emission are reduced by 15%. In both cases 540GtC of cumulative emissions to date are assumed. Indicative analysis shows that this can reduce maximum temperature rise by of the order of 0.3-0.7°C, with values outside that range possible depending on parameters chosen, assuming an immediate switch to decline. A 2.4% p.a. decline in emissions sustained globally over decades looks likely to be difficult to achieve. It is roughly equivalent to retiring existing infrastructure after an average lifetime of 40 years, and only building new infrastructure that produces no emissions, both for replacement and to meet new demand – although the decline modelled is proportional rather than linear as implied by this analogy. Over the last quarter century there has been almost no reduction in the carbon intensity of energy use, and global energy intensity has only decreased by a little over 1% p.a., with continuing growth in energy use, which is projected to continue. It may be possible to reduce some CO2 emissions, notably from deforestation, rather more quickly than those from energy, which is one good reason for targeting those sources of emissions. The approximately linear relationship between cumulative CO2 emissions and resultant peak warming is expressed as the transient climate response to cumulative carbon emissions, or TCRE. TCRE is formally defined as the warming due to cumulative carbon dioxide emissions per trillion tonnes of carbon (TtC) released into the atmosphere (1 TtC is slightly less than double the emissions so far from fossil-fuel use and land-use change since 1750, which are estimated to total around 540GtC by the end of 2010). TCRE is closely related to the more familiar transient climate response (TCR), which is defined as the warming at the time of doubling of CO2 after it has increased at 1% per year for 70 years. TCR more generally indicates the warming due to any gradual increase in radiative forcing over a 50- to 100- year timescale. An approximate rule-of thumb is that the TCRE is about 90% of the TCR. Source: Allen and Stocker. (See also the IPCC Fifth Assessment Report Working Group 1 for further information on TCR and TCRE). This entry was posted in Climate change policy and tagged climate change policy, decarbonisation on 06/12/2013 by adamwhitmore.